Growing up in Ohio, I have always been a big Cincinatti chili fan. For those who haven't had it before, it's a beef-based chili with lots of delicious warm spices like cinnamon and cloves, and a little cocoa powder or chocolate for that je ne sais quoi element. Then, instead of being served by itself in a bowl, it comes over spaghetti. It's total stick-to-your-ribs comfort food, and it always makes me think of visiting my aunt, uncle, and cousins in Cincinatti. 1. Heat a soup pot over medium-high heat, and drizzle in a little olive oil. When it's hot, add the shallots, and saute for a minute or two. Add the ground beef and chili powder, and continue to cook, stirring often, until the beef is browned. 2. Sprinkle in the cocoa powder, garlic powder, cinnamon, cumin, cloves, red pepper flakes, and salt, and stir to combine well. 3. Add the tomato sauce, Worcestershire sauce, cider vinegar, and water. Stir to combine, and then bring to a boil. Lower the heat, and simmer for 90 minutes, uncovered. Check on the chili occasionally and add a little water if it looks like it's getting too dry. 4. 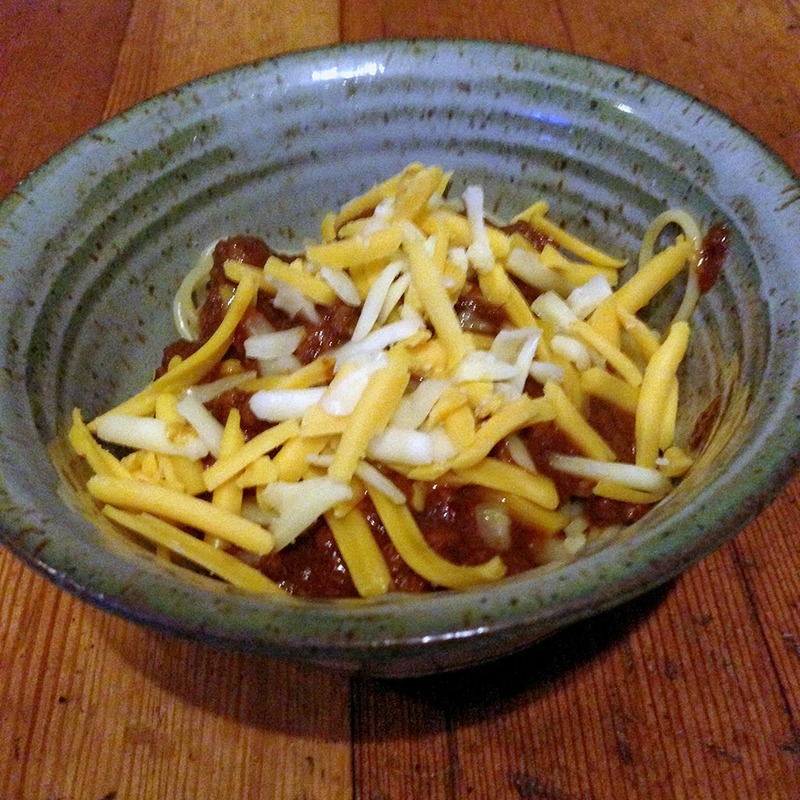 Serve the chili over cooked pasta, and top with shredded cheese. Other traditional toppings include minced onions, beans, and oyster crackers. I've been continuing to enjoy Teeny's Tour of Pie, and this weekend I finally got the time to make the Peanut Butter Brownie Pie recipe that I've had my eye on for a while. Peanut butter and chocolate is pretty much my all-time favorite combo, and when you add in pretzels...I'm in heaven! The brownie layer is super rich and gooey, with a good balance between the chocolate and the peanut butter. The crust is a little crumbly, but adds a nice textural element and a little salt. At least with the pretzels I used, I didn't find the crust to add a ton of salt -- if you're a big fan of the salty-sweet combo, you might want to add a sprinkle of sea salt over the brownie layer before baking. Either way, you'll definitely want to serve this pie a little warm, with a big scoop of vanilla ice cream. Dessert heaven, here I come! 1. Make the crust. Preheat the oven to 350 degrees. In a small bowl, stir together the pretzel crumbs and melted butter. Press into a thin, even layer in a pie plate. Bake 5-7 minutes, and then let cool completely. Pop into the fridge and chill at least 30 minutes. 2. Make the brownies. Preheat the oven to 350 degrees. Melt the butter, chocolate, and 1/4 cup of the peanut butter in a double boiler. Remove from heat, and whisk in the cocoa powder. Let cool to room temperature. 3. In a large bowl, whisk together the eggs, sugar, and vanilla. Slowly whisk in the cooled chocolate mixture. 4. In another bowl, whisk together the flour, baking powder, and salt. Add to the egg-chocolate mixture and mix until just combined. Pour into the prepared pretzel crust. 5. Warm the remaining 1/4 cup peanut butter over low heat until it is hot and liquid. Dollop over the brownie batter and swril with a knife. 6. Bake 35-40 minutes, until a tester comes out clean. Cool before serving. I received a complimentary review copy of this cookbook. All opinions and recipe-testing are my own. Whew! Sorry for my long blogging absence...I got really sick, and then just as I was getting better, had to leave town for a conference. Luckily I am feeling much more healthy, and ready to get back in the kitchen! But first -- back at the beginning of April, I held a giveaway for the fabulous cookbook Teeny's Tour of Pie. The winner of the cookbook is Lisa of Sweet as Sugar Cookies. Lisa - check your email so I can get your new cookbook to you. 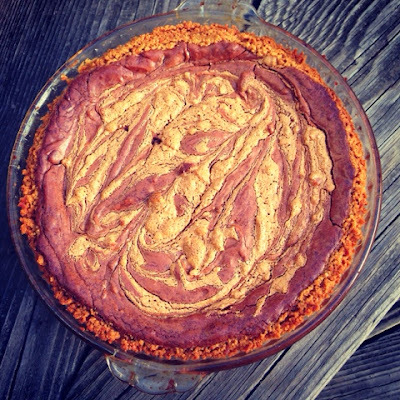 I do have more pie-baking in the works...check back later this week for a peanut butter-brownie pie (yum). Congrats to Lisa! While you're waiting on that pie, you've got to try this strawberry-kiwi jam. I made this jam a few weeks back when our CSA was overflowing with kiwis. I like kiwis, but I don't necessarily want to eat them every day, and this jam was the perfect solution. Making a small batch means you don't spend forever cutting up fruit, and you can make the jam in a regular skillet rather than a big pot (so it gets done sooner). 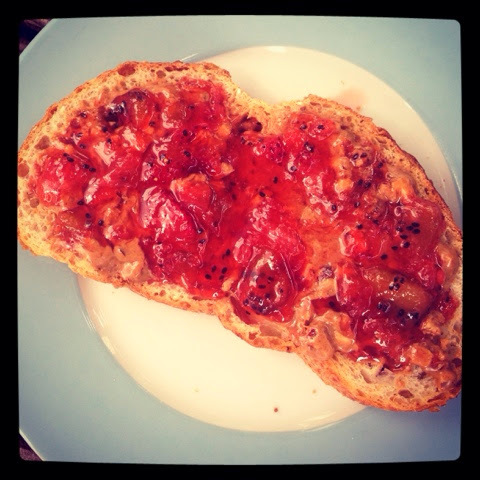 The jam is a perfect partner for almond butter on toast, and it would also be great swirled into yogurt. I love the little kiwi seeds scattered all through the jam...so cute! 1. Once your fruit is trimmed and chopped into small pieces, measure out how many cups you have. Use half as much sugar -- I ended up with 4 cups of fruit, and so I used 2 cups of sugar. Combine the fruit and sugar in a bowl, along with the lemon juice. Stir to combine, and let sit about 10 minutes. 2. Stir the fruit mixture well, and then transfer to a large skillet. Turn the heat to medium-high, and bring the fruit to a boil. Let it bubble at a low boil, stirring often, for about 10 minutes. The jam will be slightly thickened and starting to gel. You can add a bit of butter along the way if the fruit gets too foamy. 3. Transfer the jam to clean jars, and stash in the fridge (if using within a couple of weeks) or the freezer (if you want to keep it around for a while). Pickled Beet-Goat Cheese Tart + Giveaway! I was recently asked to review a new pie-themed cookbook, Teeny's Tour of Pie. I am a big pie-lover, so I jumped at the chance. My favorite thing about this cookbook is that it contains recipes for some really unique pies...I am the sort of person with a million cookbooks on my shelf, so I don't really need yet another recipe for pumpkin pie. You'll certainly find some of the classics in here, if that's what you're looking for, but there are also unusual flavor combinations that you can't find elsewhere. A few that caught my eye were green chile apple pie with cheddar cheese crust, sweet roasted almond pie, grapefruit-pomegranate pie, and chai cream pie. And, of course, this pickled beet-goat cheese tart. This is one of those recipes with a lot of elements, but you will be so happy when you sit down and take a bite! Luckily, many of the elements can either be made ahead, or (gasp!) purchased. I made the beets a couple of days ahead, and ended up purchasing the candied walnuts at Trader Joe's. You could also buy the beets (just make sure you get something high quality, like these from Happy Girl -- you wouldn't want to make this with cheap canned beets) or even the crust if you're feeling short on time. Once you've got all the elements made (or purchased), they all get layered together into an amazing combination of flavors. I thought this pie sounded good when I read the recipe, but I was still blown away at how tasty it was! Even my somewhat anti-beet fiance liked it. 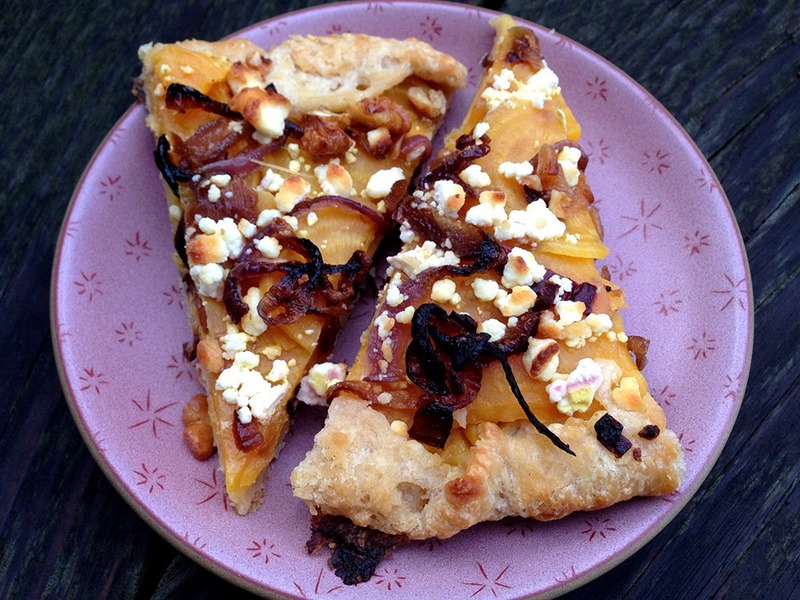 The combination of pickle-y beets, creamy goat cheese, sweet onions, crunchy walnuts, and a buttery crust is simply divine. And, it is your lucky day, because I have a copy of Teeny's Tour of Pies to give away to one of my readers! Simply comment below with your favorite kind of pie (either sweet or savory) to be entered to win -- U.S. mailing addresses only, please. Make sure you leave your contact info so that I can get in touch with you if you are the winner. Thank you so much to Food Lion for generously sponsoring this giveaway...I know you are going to love this cookbook as much as I do! Give them some love on Facebook if you are so inclined. I will announce the winner next week, along with another yummy pie from Teeny. Scrub and trim the beets, but don't peel. Place in a large saucepan, and cover with water by 1 inch. Bring to a boil, and cook until tender, about 20-30 minutes (depending on the size of the beets). Let them cook, and then slip off the skins under running water and slice thinly. Whisk together the vinegars, sugar, and salt in a bowl, and then add the beets and very gently stir to combine. Let sit in the fridge,covered, at least 3 hours before using. Whisk together the flours, salt, and sugar. Cut in the butter and shortening using a pastry cutter or two knives, until the larges pieces of butter are the size of peas. Sprinkle in the vodka, and stir together with a fork. Sprinkle in the water, a tablespoon at a time, stirring with a fork after each addition. You may need to use a rubber spatula or your hands at the end -- the goal is a fairly sticky ball that holds together well. You may need to add more or less flour. For the ball into a flat disk, wrap in plastic, and chill in the fridge for at least 1 hour before using. Preheat the oven to 400 degrees, and line a baking sheet with foil. Whisk together the sugars and salt in a medium bowl. Add 2 T water, and whisk until smooth. Add the walnuts, and stir until evenly coated. Spread evenly onto the prepared baking sheet, and bake until the sugar begins to brown, about 20 minutes. Let cool. Heat a non-stick skillet over medium-high heat. Add the oil, and let it heat up for a couple of minutes. When the oil is hot, add the onions and cook, stirring occasionally, until caramelized. This should take 15-20 minutes. Let cool until warm or room temperature. Preheat the oven to 400 degrees and line a large baking sheet with parchment. Roll out the chilled crust into a 12-inch circle, about 1/8-inch thick, using a little flour to keep the dough from sticking. Transfer the crust to the parchment-lined baking sheet. Arrange the beets on the crust, leaving a 1-inch border around the edges. You might not use all the beets -- basically, you want a single layer with some edges overlapping and no gaps. Scatter the onions and goat cheese on top of the beets. Fold up the edge of the crust so that it slightly overlaps the filling. Bake 30-40 minutes, until the crust is cooked through and the cheese is browned. Sprinkle with the candied walnuts and serve. Leftovers are great at room temperature the next day. I was provided with a complimentary copy of this cookbook for review purposes. All opinions and recipe-testing are my own.